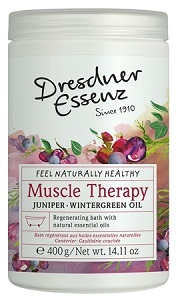 Dresdner Essenz Muscle Therapy Herbal Bath has a base of pure Sea Salt and contains the essential oils of Juniper and Wintergreen, and has a particularly beneficial effect after strenuous work or sporting activities. When combined with the warmth of the bath water, these oils stimulate blood circulation and have a relaxing effect on the muscles. It also contains Sesame Oil combined with Wheat Protein and Panthenol to leave the skin noticeably soft and smooth. The powder contains no PEG emulsifiers, no alkaline soaps, no sodium laureth sulfate, no mineral oils, and no silicone oils. Not suitable for children under 3 years of age.